You can’t go wrong with these practical, crowd-pleasing wedding favours! 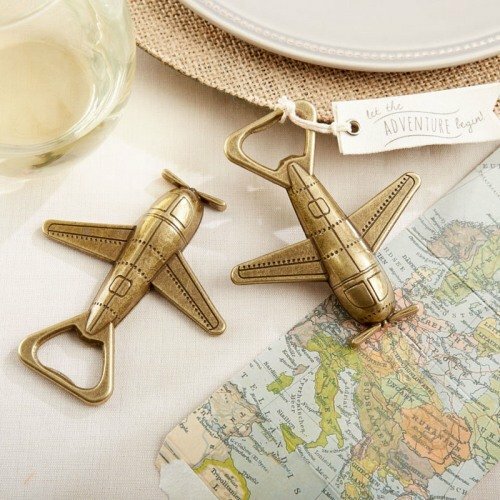 These stylish bottle openers are far from ordinary...with choices ranging from romantic, vintage, modern, seasonal and beyond, you are sure to find the perfect match for your wedding theme! These creative openers are also popular for bridal showers, and engagement and bachelorette parties. 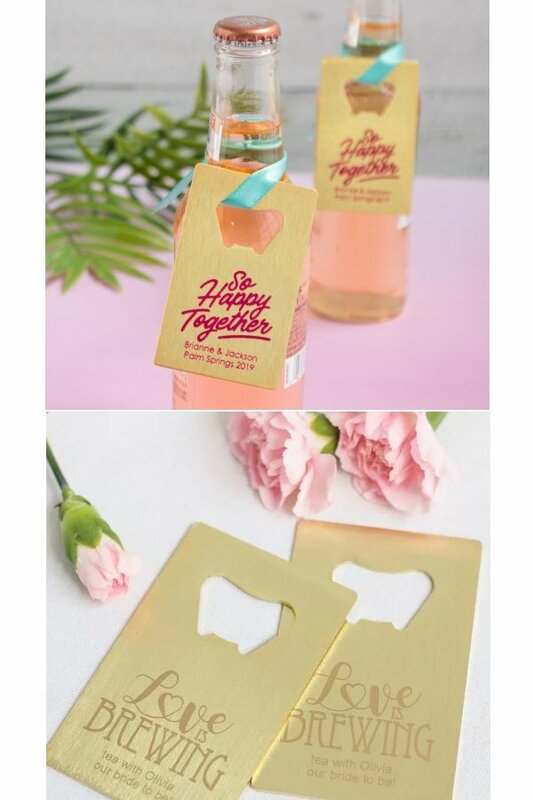 For the best in bottle opener wedding favours - here are our favourites! 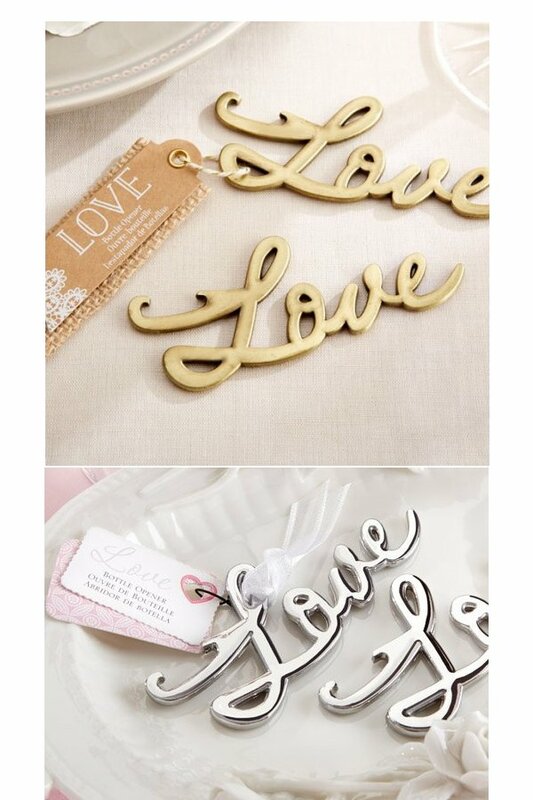 Elegantly designed to feature the word love in a cursive font, this sturdy bottle opener is ideal as guest favors for your reception, shower, or anniversary party. Each bottle opener comes decorated in your design choice, color choice, and special message. 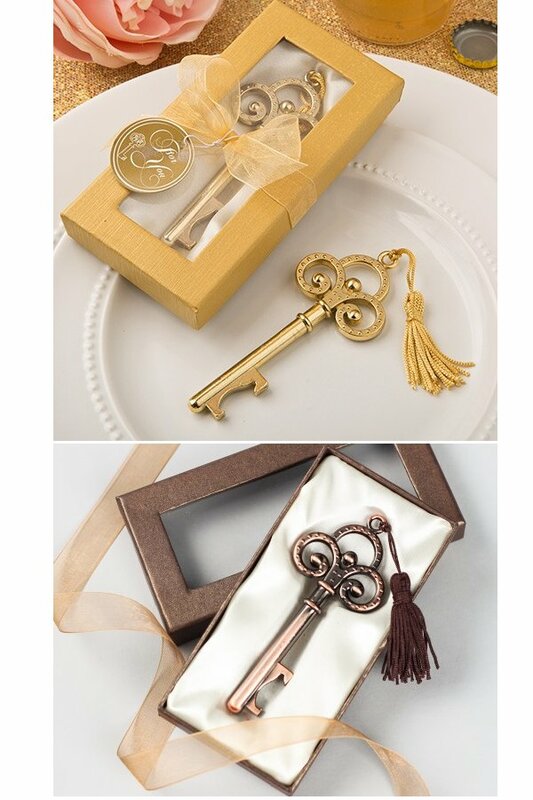 Your guests will love the visual appeal of these stylish favors as well as their useful functionality. Customize with your favorite design and color choices and then personalize with your names, event date, or special message for a truly one-of-a-kind favor they'll appreciate and use for years to come. 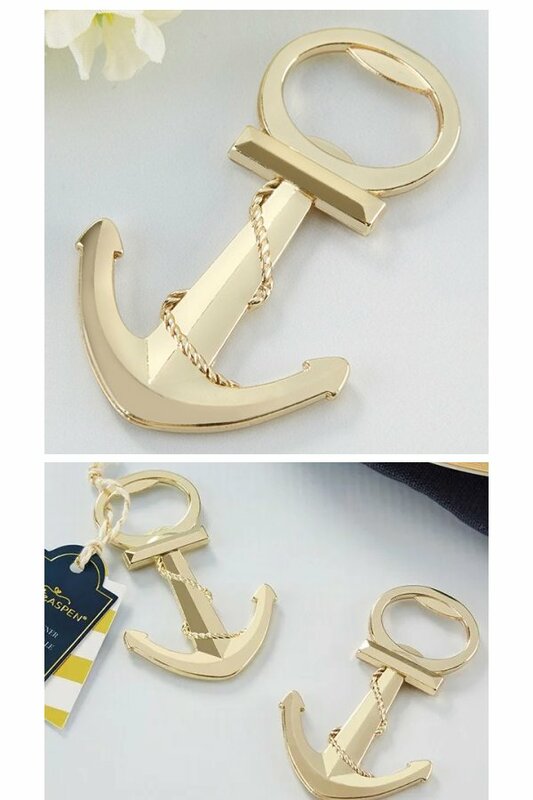 Each gold bottle opener is shaped just like an anchor with a slot for opening on top. Use during your event, or tie with a thank you tag to send home with your guests! Feature a brushed metal finish and are fashioned in the shape of an anchor wrapped up in a rope. 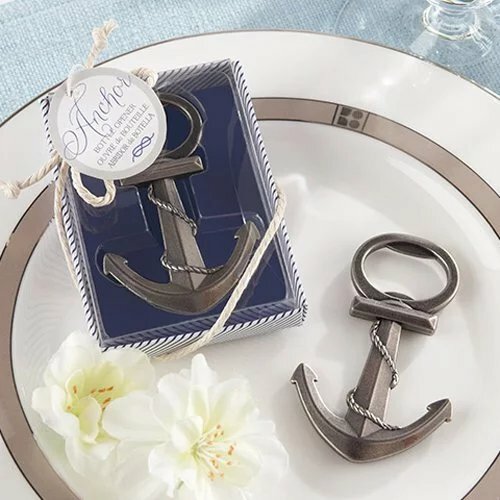 Each bottle opener arrives individually packaged in a nautical-themed gift box, ready to give to guests as practical favors. 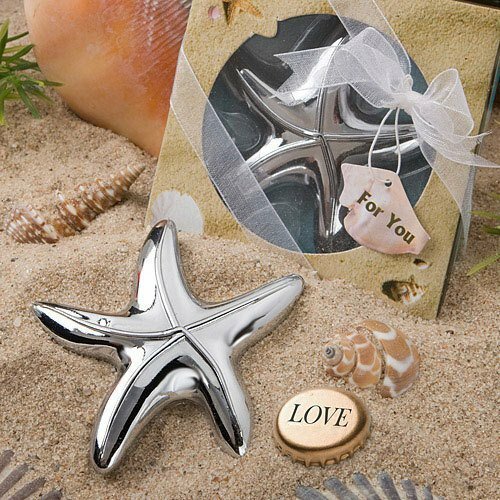 Topped with a shiny chrome finish, each metal bottle opener looks like a stylized starfish. Arrives packaged in a beach-themed box with a clear-view panel and shell-shaped "For you" tag. 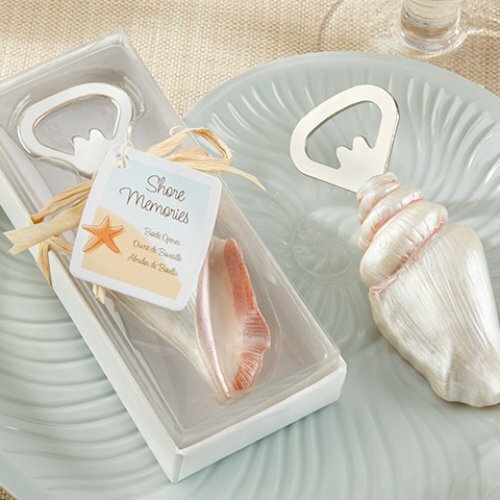 These attractive, lifelike, and hand-painted seashell bottle openers come individually packaged in a beautiful gift box. 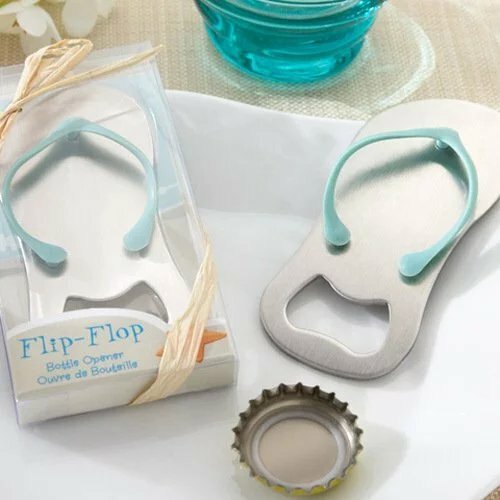 The brushed metal bottle opener is shaped like a sandal down to the turquoise rubber flip-flop thong. Arrives festively packaged in a clear, beach-themed box wrapped with a raffia bow. 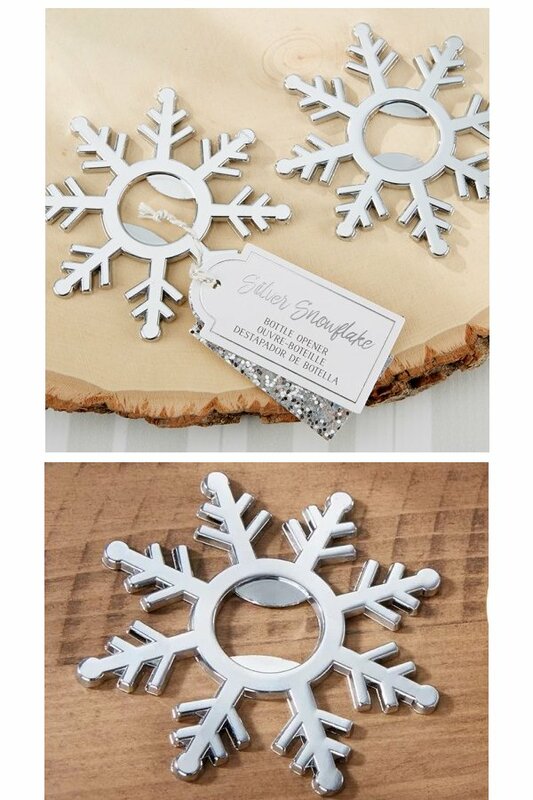 Simply add a personalized thank you note to this silver snowflake bottle opener for a unique, and practical wedding favour. 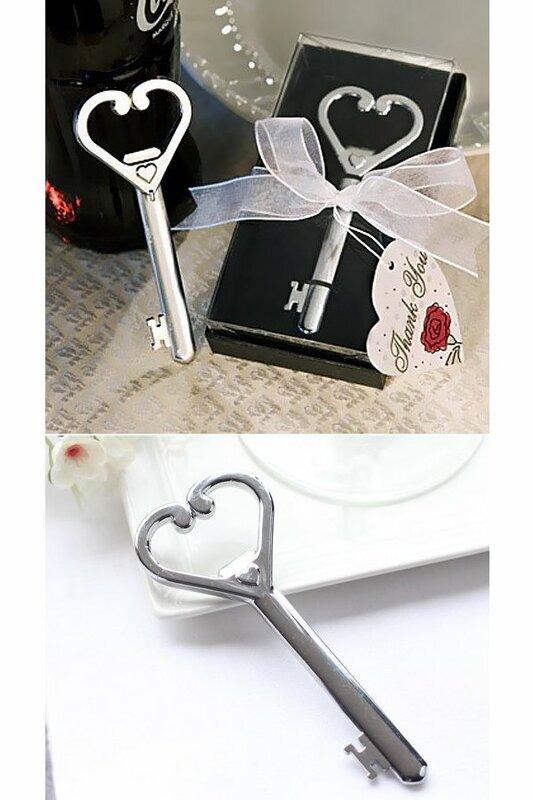 Practical and romantic at the same time, this bottle opener, fashioned after an antique key, is the perfect party favor for those who want to give a gift that is useful while keeping the affair upscale and elegant. 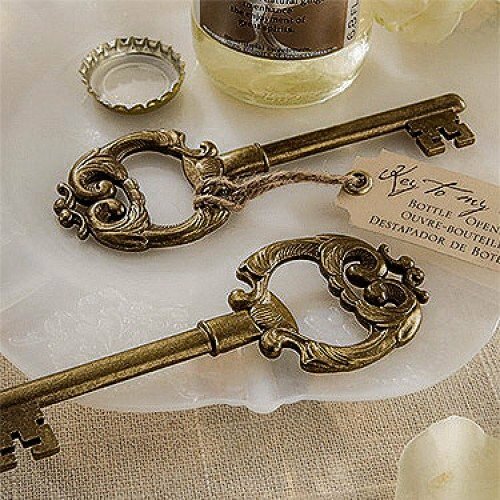 Perfect for vintage weddings, these beautiful bottle openers are made of solid metal and fashioned into the shape of an antique skeleton key. 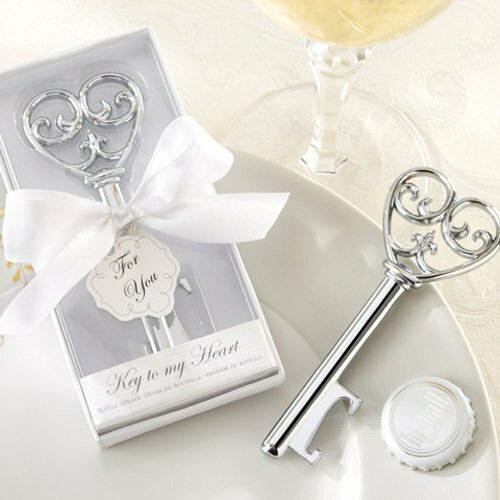 Resembling an old-fashioned skeleton key, this heart-shaped bottle opener is a great way to remind guests of your wedding day every time they open a bottle. This antique looking key is finished with an attractive gold wash and decorated with a hangtag and complimenting twine. 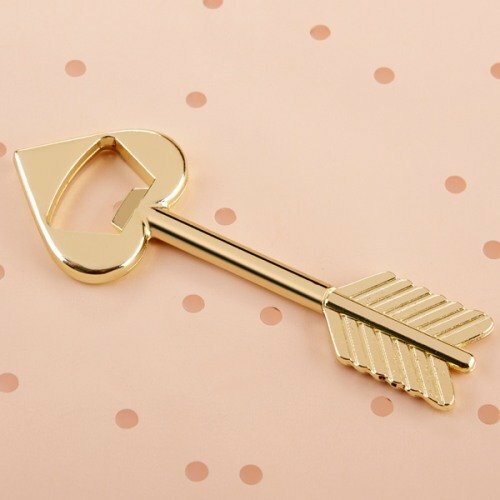 The romantic gold-toned metal heart shaped arrowhead bottle opener works on all standard sized bottles. 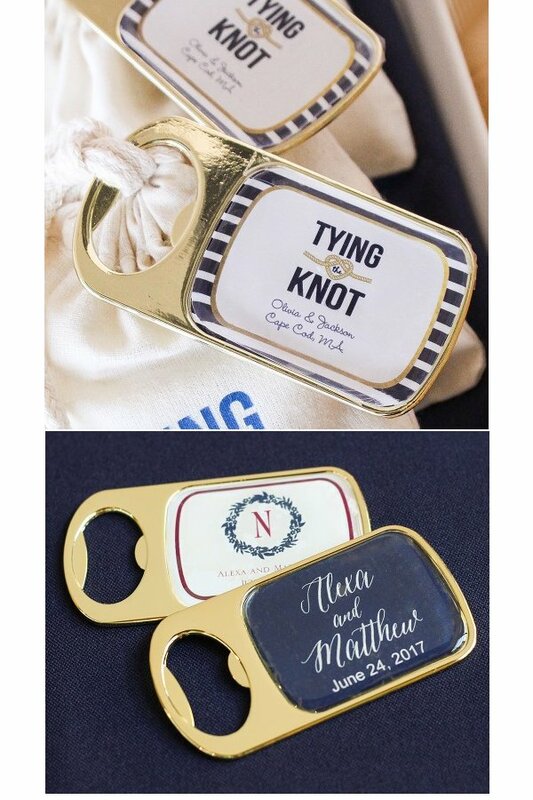 These detailed bottle openers feature an antique bronze finish and come complete with a coordinating fabric gift tag. It's a practical and stylish favor all in one! 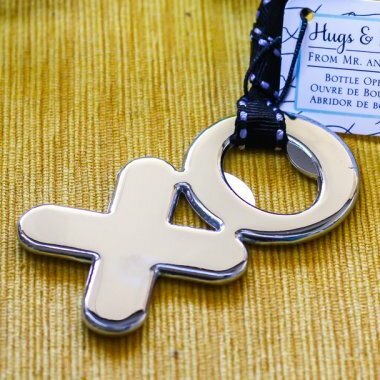 The chrome bottle openers come with their own gift tags, ready to hand out as guest favors. 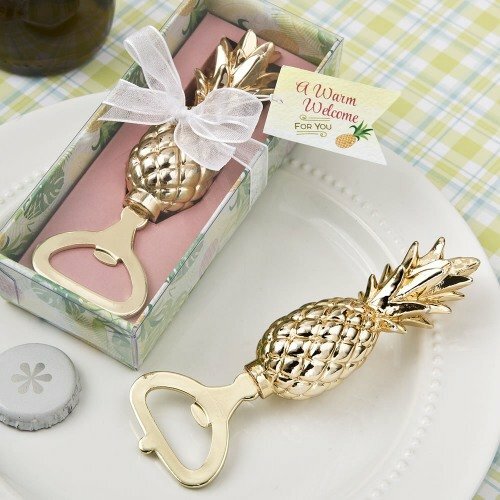 The Gold Pineapple Bottle Opener adds style to any event with an opening on the end for easy opening of bottles. 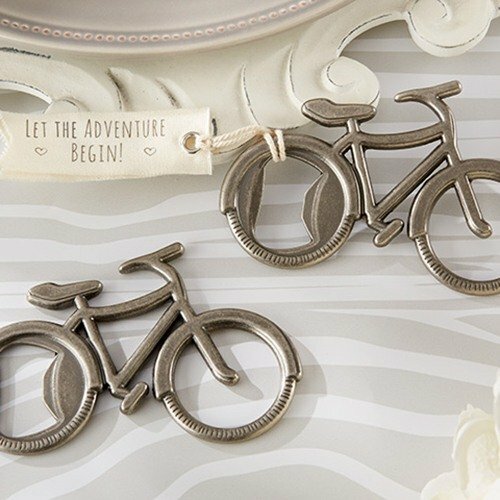 These cute little bicycles are carefully designed to resemble the intricacies of a real bicycle, comes with an attached fabric tag stating "Let the Adventure Begin! ", and acts as a bottle opener with its grommet design. 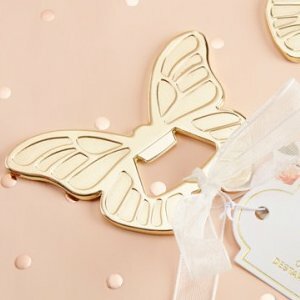 This butterfly bottle opener is a great statement piece for any table, party or bar! 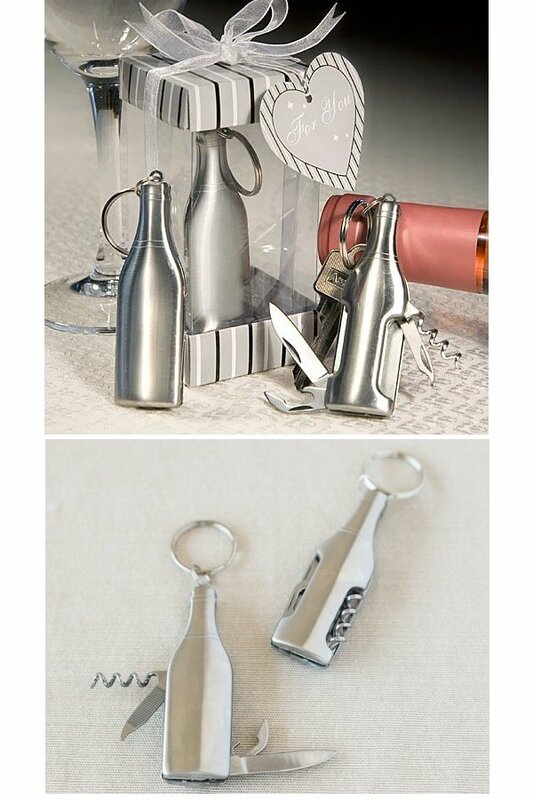 Guests will love this practical favor to open their favorite beverages.